Where to even begin this week?! How about the people who never called me back when I am a stellar person. I just wanted a job, yo. I guess that is too much to ask. Oh well. 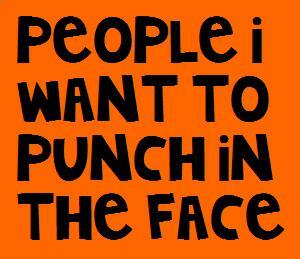 Or the people I have been having trouble dealing with? Ok, I can’t actually mention who they are, but trust me on this one, they deserve it. How hard is it to make some people new to the state feel welcomed and not be an asshat when they have no clue how things are done around here? Send me a piece of mail! Gah!! I guess this is a hard thing to do, COMMUNICATE. I cannot wait to move. This entry was posted in punch in the face. Bookmark the permalink.